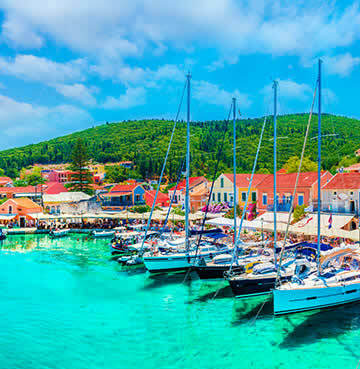 The island of Kefalonia is fast becoming the place to go in the Greek islands, and has held on to the laid-back and rustic charm it's famous for. It's a paradise for those looking for a good beach, a good swim and some good food and drink. The dreamy destination was made famous in 2001 with the release of Captain Corelli's Mandolin which was filmed at several locations as the locals are proud to state. Step off the plane and discover this idyllic Ionian island. Landing in Kefalonia you'll feel like you've stepped into a postcard! Rugged mountains are carpeted by verdant greenery, while plunging cliffs are lapped by cobalt blue and light turquoise seas. Exploring the island is pure paradise for nature lovers. A must see is Melissani Cave. This breath-taking underground lake wasn't discovered until 1951 after an earthquake shook the cave and collapsed the roof, leaving a massive hole in the ceiling from which light pours through. 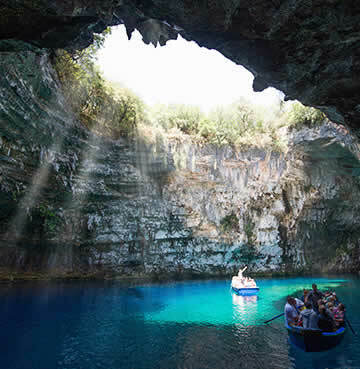 Take a boat ride to the cave and get up close and personal with this wondrous natural beauty. Mount Ainos is perfect for those looking to stretch their legs. Multiple trails twist and turn around the mountain and through the surrounding forests where wild horses roam and incredible scenery awaits. These trails range in difficulty from those for the die-hard hiker to the casual meander you can explore your own little slice of nature here. 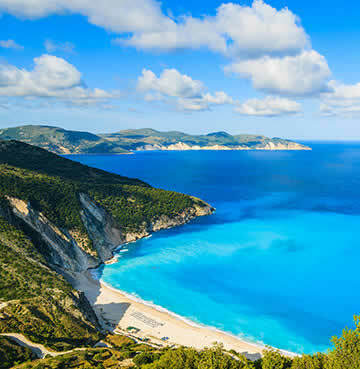 Kefalonia is a beautiful island, filled with gorgeous beaches and fantastic atmosphere. However, if you fancy a change of pace then Kefalonia is the perfect place to be. Nestled in the centre of several of the Greek islands in the Ionian sea, grabbing a ferry to explore more of island life is highly recommended. Ithaka, Zakynthos and Lefkas are all a short ferry ride away and make excellent day trips! Ithaka is the stuff of legend, literally. The final stop in Odysseus' journey this small island holds an air of magic and history about it. Beautifully serene and quiet, the island is the perfect representation of quiet island life. There are plenty of hiking trails and small towns to visit so you will be spoilt for beautiful scenery and photo opportunities. Further north is Lefkas. Home to beautiful hidden coves and beaches there's a hidden gem every time you visit. Why not swim underneath the stunning Nidri Waterfalls or sip Ouzo in Lefkas town against the pale pink and baby blues of the architecture? Heading south you can always visit Zakynthos! One of the most popular and well-loved Greek holiday destinations you're certain to find something for everyone here. 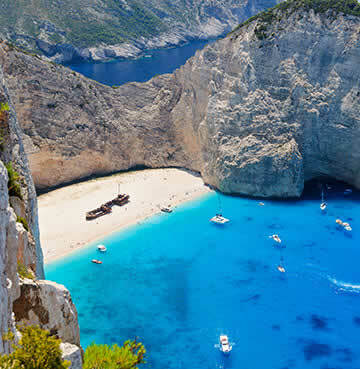 From the world-famous Navagio beach (also known as shipwreck cove) to Zakynthos Town with its stunning architecture, rich history and rustic charm. 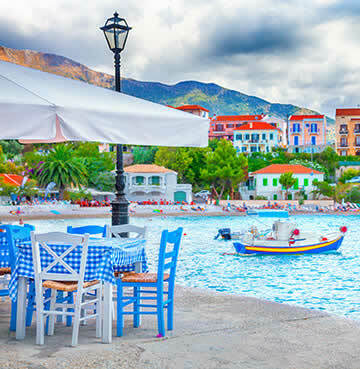 Let's be honest, there's far too many amazing towns and villages on Kefalonia to list! Argostoli is the biggest town (and capital) of Kefalonia, so naturally your holiday wouldn't be complete without a visit. With an abundance of museums, bars, restaurants and shops you could easily spend days wandering through the town. Be sure to visit the promenade looking out over the harbour and sea beyond. When in Greece, eat and drink as the Greeks do! Although Kefalonia has plenty of restaurants that serve meals that you know and love, for the more adventurous foodie this is a wonderful treat. Head to one of the local tavernas and you'll find home-cooked traditional Greek dishes. This is as authentic as it gets and all topped off with a side of stunning Kefalonia scenery. Robola wine is grown primarily on Kefalonia by the Robola Cooperative and is found all across the Greek Islands. This dry medium-bodied white wine has notes of lemon and is a great accompaniment to many of the traditional seafood dishes available at restaurants. Heading to a tasting at one of the vineyards on the island is always a great experience with plenty of delicious varieties to try. The beaches on Kefalonia are world famous and regarded as some of the most beautiful in the world. It's little wonder that Hollywood decided to use the island as the location for Captain Corelli's Mandolin. At every turn, there's beautiful beaches and coves to discover and enjoy. A slice of quiet island life. Myrtos beach is by far one of the most famous beaches on Kefalonia. White sands and pebbles rest against sheer limestone cliffs, overlooking the electric blue waters of the bay. As you make your way down the winding road towards the shoreline, you'll understand why this is such a popular destination. It can get a little busy in high season, but as they say, the early bird catches the worm… The very definition of a bucket list beach, sunsets here are quite the spectacle. The dipping sun transforms the waters from deep blue to burnt orange and light rose, a picture-perfect moment if ever there was one. Kefalonia's beaches hold a wide palette of colours, from Myrtos beach's white sand to Xi beach where light green waves meet fine brick red sand. The latter is great for families or those looking to spend a whole day relaxing by the sea, with gentle waves splashing the shore and a seafront bar to unwind from a hard day sunbathing. There are also a few watersports and snorkelling outlets available for those looking to make a splash. 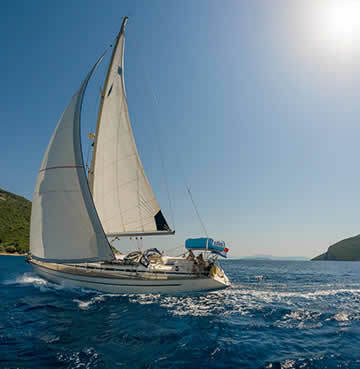 Kefalonia is a wonderful place to find your sea legs and set out on an adventure. For those looking to see the most of the island, hiring out a boat is the way to go. With a large number of coves and caves to discover there's always somewhere new to explore. Whilst sailing look out for the Loggerhead Sea Turtles that call the Ionian home. These beautiful animals are one of the oldest life forms on Earth and the chance to see them is fantastic. For the water babies amongst you, there are lots of snorkelling and scuba diving opportunities available to enjoy the deep turquoise waters with. Aside from the turtles, there is a vast array of marine life to enjoy from hard and soft coral to beautifully coloured fish and crustaceans that call the rocky seascape home.